Would it be unreasonable to suggest the people who came up with pressure cooking deserve our praise and gratitude? How often has the speed and finesse that only a pressure cooker can provide saved us, how often could we just about make it to that important appointment solely because we were fortunately able to cook this much faster? To celebrate this ingenious contraption, we thought it’d be more than appropriate to showcase the very best pressure cookers on the market, made by the most trusted brand in the sector, NuWave, and compare them to give those few ones who haven’t had the chance to experience their brilliance a reason to do so. Enjoy! Here are some best options from NuWave Brand. 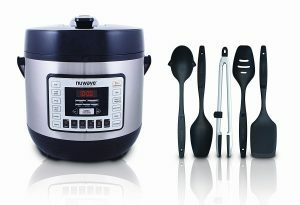 This NuWave Pressure Cooker was designed to be a compact, high-tech product that can be used anywhere to cook nearly anything in relatively short order compared to slow cookers, instant cookers and other alternatives. Reviews of this NuWave model are overwhelmingly positive as you’d expect, and much of this comes down to the neat blend of quality and competitive pricing. At just about $100, it won’t break anyone’s bank, and the tough construction means those dollars will stay a one-time payment for years to come. As with most kitchen appliances today, even the NuWave has long become digitized; the front part of the device features a relatively large LCD with capacitive touch controls and countless settings to fiddle with. 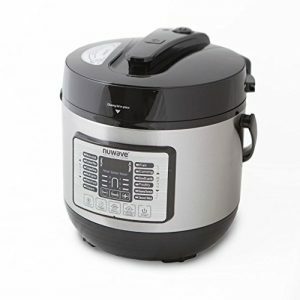 Though the 8-quart capacity may not seem like much, in a direct comparison against NuWave’s main competitor, the Instant Cooker line of products, it’s right on par, both in terms of price, capacity and overall performance. So, what is it that sets NuWave apart? Simply put, the aforementioned build quality. It’s just perfect. Metal in all the right places, plastic only where it’s actually needed for heat conductivity purposes, and nothing else anywhere to be seen. The 11 modes and settings provided do sweeten the experience as well, it is to be noted. From baking to canning and several presets for popular dishes of all sorts, it’s all there, and it’s all easily configured and set up, too. Cooking, as you’d expect, is seriously quick, and the results don’t stain NuWave’s reputation. What slightly threw us off, though was the slightly confusing selection of ‘Optional’ extras available for the device. For example, there’s a purely ‘optional’ rack that one can buy and install at a surcharge—but without it, the pre-installed baking option won’t work. Similarly, the ‘optional’ glass lid is actually required for the, again, pre-installed, default slow cooking mode. Why, NuWave, why? All in all, the 8-quart digital pressure cooker by NuWave is nothing short of brilliant in its execution. Yes, the whole options debacle can get on your nerves, especially when you have to re-evaluate the whole purchase because two thirds of what you bought isn’t included in the sticker price—but in any case, whether for $100 or $200, this is as close to a perfect product as any kitchen appliance can hope to be. Kudos, NuWave! You got it right! Don’t get confused—an ‘Electric’ cooker is exactly the same thing as a ‘Digital’ one. The major difference between this and the relatively similar 8-quart model is that, well, this one only holds 6 quarts. Consequently, it’s some $20 cheaper. Big deal? Let’s see. To start off, nobody really needs 8 quarts, do they? There’s not much you can’t cook with only 6, or even less if you’re really resourceful. Large cookers are mainly a luxury, nothing more. That’s fine, of course, but if you can live with less, while also paying less, and still get the same cooking experience and performance, why bother with all the expensive stuff? That’s probably the train of thought that led to the creation of this NuWave model in the first place. Comparing it to the competition—and there’s lots of competition in the 6-quart capacity segment—the NuWave costs about the same, perhaps $5 more or less than similar offerings by Crock-Pot and Instant Cooker, while offering more modes and settings for you to play with. It also uses a lot more metal in its construction, which can only mean good things for durability. Every cloud has a silver lining, but in order to be able to see that silver lining, there needs to be a cloud first, for contrast, right? Well, that seems to be the situation with this NuWave, too. Not only does it carry over most of the 8-quart model’s strengths—it also repeats its mistakes. There are those confusing, price-jacking ‘options’ again, and they’re just as detrimental to the cooker’s overall rating as before. Additionally, some might find the 6-quart capacity to be just a tad low for their tastes. Of course, if you’re preparing a five-course buffet for six people, then an ultra-compact model like this, or even a slightly larger 8-quart derivative, might not be enough. Who are we kidding; it definitely won’t be enough, period. But if you’re like the average person and don’t tend to cook meals that are larger than your own body, then this 6-quart NuWave represents everything that its larger brother is already good at, but more compact and less expensive. Where the catch is? We still haven’t found one. Instead of yet another sized-down variant of the great 8-quart model we reviewed above, this 6-quarter, although looking very similar, is a different beast entirely. As the name implies, this NuWave is optimized for healthy eating, and it even comes with a whole set of utensils! Featuring the same 11 preset modes as on other NuWaves, complemented by a full cookbook, the NutriPot is definitely much more user-friendly than many other models from the moment you unpack it from its nicely-finished box. A feature exclusive to the NutriPot, which immediately presents itself to you visibly in the form of a round, red button on the lid, is the so-called SureLock. This, with the help of a tiny LED, lets you know if there’s still pressure in the inside of the device, so that you don’t accidentally open the NutriPot too early. Then there’s that health aspect: The NutriPot uses a slightly different cooking mechanism than most other devices in its class, and, through even shorter heating and cooling periods than competitors, preserves healthy minerals, vitamins and such to keep your meal’s nutrients intact. It can even tenderize meal up to that perfect degree! Or that’s what NuWave claims, at least. To be honest, the NutriPot isn’t that much faster than other comparable pressure cookers, and we observed no real difference in the taste of the finished meal (though we do have to say that, no matter the NuWave, that taste remains excellent). Still, it’s great knowing that every bite you take will be just a tad bit better for your body when it comes out of a NutriPot, no matter how small the difference. At roughly the same price as a regular 8-quart NuWave, considering all the extra features you’re getting, the NutriPot is great value, too! 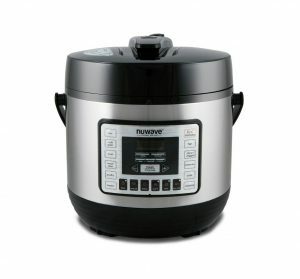 With this many extras and improvements over standard pressure cookers, how could we not call the NutriPot the best NuWave currently on the market? It takes everything that makes our other two contenders so great, adds things that were either only available as costly ‘options’ or not at all, improves on areas that were never even touched upon on other models, and finishes it all off with the great quality, value and performance that NuWave is rightfully known for. Definitely recommended! We hope that this broad overview of NuWave, their products and how they compare gave you a rough idea of the state of this niche market, and how to plan your next purchase. Pressure cookers can be wonderful appliances that can save you lots of time and stress, but you have to get a good one, obviously! Any of our top picks will do the job well, but personal taste is always a big factor. And with that, sit back, relax, think some, and freely choose from any of the dozens of great models out there! We’re crossing our fingers for you!